Anything that contains Paleo mayonnaise is just delish, really, it is. Add it to a bowlful of broccoli florets and kids might tuck into it too, seeing that it is covered in a delicious sort of sauce. Toss in some almonds and crispy bacon, and the salad is starting to become fun! It’s a great way to get some raw veggies into your diet, and the best part? You can make it in 20 minutes and have a refrigerated side salad ready for unexpected guests, and if you happen to have some cauliflower tortillas ready and waiting, they will think you cooked just for them! It is always nice to share good food, so make sure to choose organic broccoli for your guests, and for the glowing of your own health too. 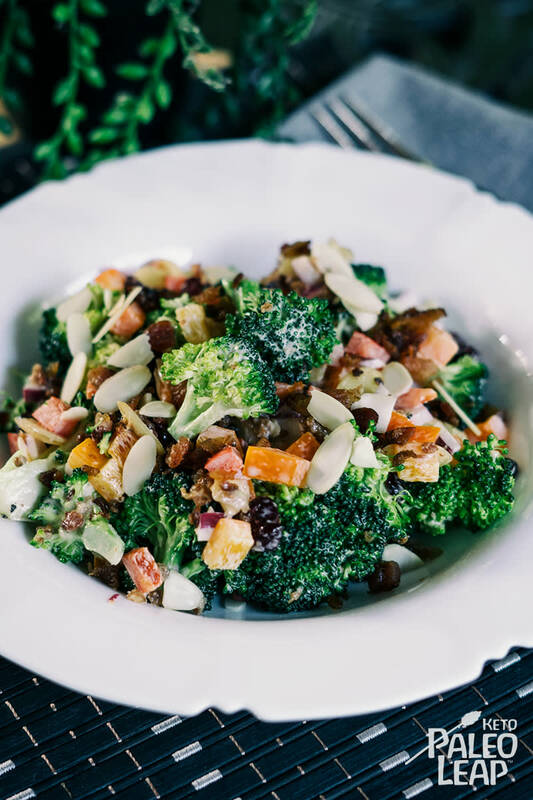 Broccoli has many nutritional benefits ranging from cancer prevention, to improving your digestive system and lowering cholesterol and that follows in line with it being a cruciferous vegetable. It also happens to be extremely rich in vitamin C, which is great while you are limiting your fruit intake. If you are opting for the optional cranberries, make sure to read the label before you buy, as they may contain added ingredients that you will be wanting to avoid, such as sugar or artificial sweeteners. Other than that, you are free to enjoy the broccoli salad – may we suggest it with some grilled and seasoned drumsticks? In a bowl combine the mayonnaise, olive oil, vinegar, lemon juice, lemon zest, paprika, salt and pepper; whisk until well mixed. Add all the remaining ingredients to a salad bowl. Drizzle with the mayonnaise vinaigrette, and toss until well coated.